10. 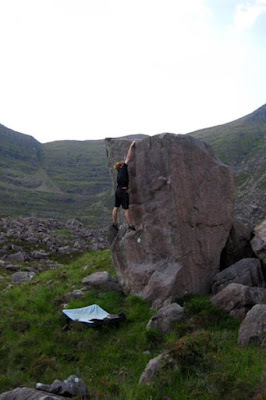 The perfect example of the 'community' nature of bouldering is this particualr problem - a hybrid of two hard previous problems by Tim Rankin, linked into the natural 'hardest line' ideal which leads all us boulderers astray! Seeking the boundaries of the climbable is what it's all about, it wouldn't be as much fun if no-one had gone before and we had nothing to 'stretch'. This continuum was exampled by a strong Luke Fairweather when he climbed Twilight Princess at Portlethen - a link of Kayle (8a) and The Pit Left Hand (7b+). It weighs in at a mighty 8a+ and sets the bar for the north east, well done Luke on a powerful addition to Scottish bouldering! 9. Apologies for putting one of my own problems in, but I did discover one delight in the Trossachs, an area with a boggy but exciting potential. I've discovered possible 8c's for those who can climb to this level and plenty of projects up to 8a which will keep me busy for a few years! It was a poor year phyically for me what with too much work and various injuries, but my favourite of the year was an immaculate 6c roof and lip I found off the beaten track to Ben A'an. A perfect little problem in a fantastic location: Hocus Pocus. 8. Lee Robinson is my favourite advocate of remote and adventurous bouldering, his appetite for going the extra mile is legendary. 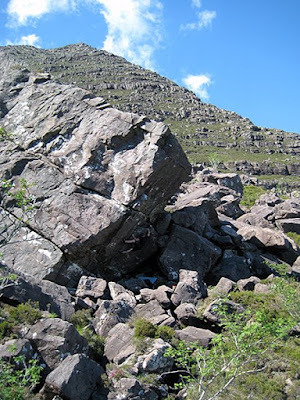 Lee has discovered some of Scotland's furthest but most exciting venues and this year he tapped the boulder field of Beinn Alligin in the North West, which he describes as 'a giant amphitheatre of boulders sitting under the jewelled mountain, consisting of dense clusters and scattered free-standing boulders, good clean rock. Easily found traversing deer paths below the horns of Alligin. Listen to the underground streams and beware of the frogs!' A classic of the field is the excellent dyno of Utterly Preposterous - a superb 6b+. 7. Inverness has been the centre of a bouldering renaissance, with the hub boulder of The Ruthven Stane seeing a few new problems such as The Dude and its variations from 7a to 7b+, but nearby Brin Rock was steadily being cleaned and developed. 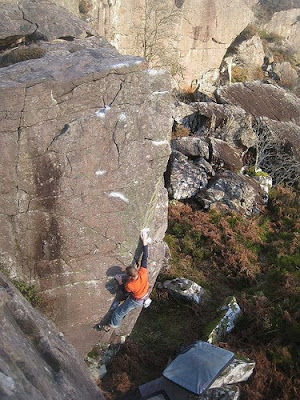 The North-West's busiest boulderer - Richie Betts - discovered a line here in January which was revealed from the mossy forest like a shiny new penny. This overhanging and technical prow requires a confident approach and a few mats, but is one of the new classics at Brin Rock - The Scientist 7b. 6. Another strong lad who has an abnormal appetite for the reachy and crimpy (but who is also unfairly smooth through the roofs) is Mike Lee. Mike has been repeating a lot of Scottish problems and producing some of his own belters along the way. Extending the radius of bouldering at Brin, Ruthven and Duntelchaig, he did such lines as Wooden Nickles 7b, Farr Side Facet 7c , The Stabber 7b, The Settler 7c ... but the highlight I thought was his tremendous traverse through Alchemy at Craigmaddie: an absorbing and complex solution to the obvious low traverse of the Sheep Pen: Allakazaam! 7c+. Nice one Mike! 5. A strong young Glasgow team has been cleaning up the repeats of older classics and starting to write their own rock documents. One strong lad in particular is Ben Litster, who has travelled around Scotland seeking the overhanging and the hard. His efforts have produced some fine lines such as Grass is Greener 7c and Diesel Canary Sit 7b in the Lost Valley, but we thought his best problem of the year was a magical and technical 7c on the gritty sandstone at Craigmaddie - Alchemy. 4. The North West has so many good lines that it's hard to pick out one that really stands out, the quality is so good in general it's rather like the Peak District's big momma... so many Torridonian Sandstone classics lie out there! Anyway, I thought the 'red gritstone' produced one particular classic line this year, by its nature quite bold and more of a traditional 'gird your loins' grit solo. Richie Betts was the man in form and he committed to the big arete right of Frantic at the Torridon Celtic Jumble. This huge line was physically not too hard at around 6b+, but it was throat-gulpingly described as 'fluffable' by Richie. Anway, he didn't fall off and we have the first of possibly many Torridonian highball aretes: Vapour Trail. 3. Having moved to Fortwilliam, Dave MacLeod turned his considerable strengths to the 'project-land' of Glen Nevis. Thousands of boulders litter the craggy hills here and there were some massive roofs awaiting a stout-hearted talent such as Dave to unleash. In a cold February I found him at the top of the Gorge working the obvious crack-line that became 'Saturn Crack', an amazing but rather awkward and dangerous 7b+. I thought this might be the highlight of the Glen for the year, but I should not have been presumptuous. Dave knocked off a string of 8th grade giants: Frontal System, Bear Trap Prow, the Sky Pilot 'Sloper Ramp', but the most astonishing feat was the full traverse of the Sky-Pilot Crag which became Big Long Now at a an ungradeable Font 8b (ish!). On photographing him on this extended 'metaclimb', it became obvious Dave was breaking the boundaries between our sports, turning it into a kind of super-fit gladiatorial contest against gravity and physics. It may be a long time before it gets repeated due to its demanding convolutions, but this traverse was the most astonishing stamina problem of the year. 1. My contender for the best problem of the year actually occurred in the bitter northeasterlies and brown-foamed seabays of an Aberdonian winter, during a very productive and strong period of climbing by Tim Rankin - Aberdeen's most devoted and consistent powerhouse. Tim knows the seacliffs inside out and had cleaned up at Portlethen, Clashfarquhar and now Cammachmore. I had seen this line years before and dismissed it as 'futuristic', mentioning it to Tim who shrugged and admitted nothing (!). But we both knew it was a distinctive challenge and hard to ignore for a local: a giant highball prow like the broken edge of an axe, blank on each side. It would require massive clamping strength and strong fingers to hold the slopiest of holds and tiniest of crimps. Having despatched the stand-up at 7b+ in February, Tim promptly added the sick sit start to give us the almighty Optimus Prime 7c+ at Cammachmore. It speaks for itself as a bouldering line: striking, challenging, direct and elegant . Well done Tim, we knew it really had your name on it! I'll be uploading some new topos to Stone Country soon, but as a Christmas Scottish bouldering offer, we are selling Bouldering in Scotland, Stone Play and Elelments the DVD at only £40.00, check the sidebar on the right if you want to take advantage. 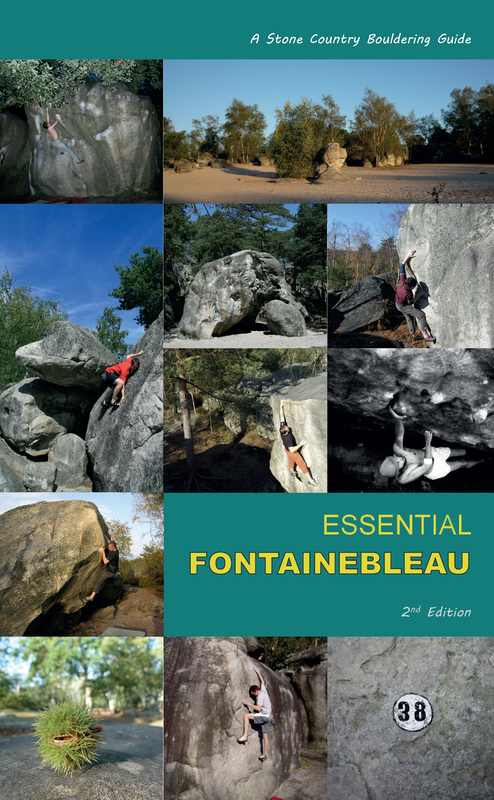 It's been a good autumn and early winter season for folks out bouldering, I'll put a report up soon of what's been done, in the meantime I'll get on with going square-eyed over fonts and upload those topos. 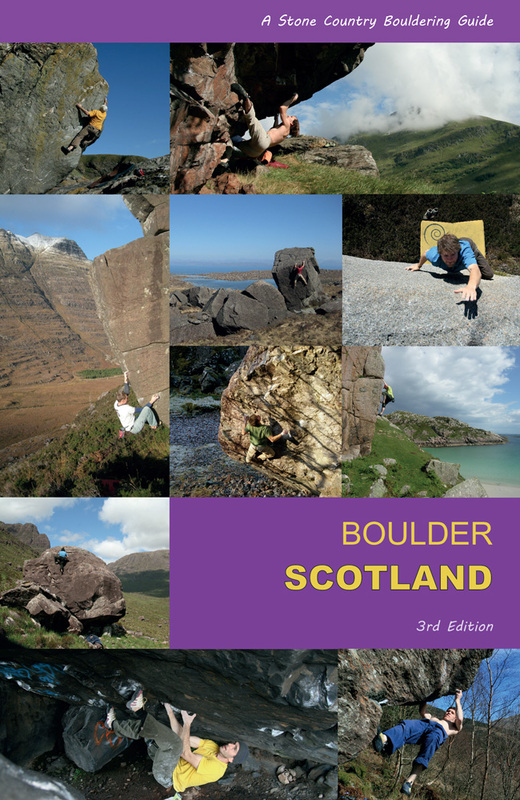 Due to technical issues the boulderscotland.com website has been taken down and will not be up till next year, so anyone wanting to get hold of the new Dumbarton Bloc guide, can do so here through the blog (on the sidebar) or on the Stone Country main site. It's a nominal price of £2.50 for a download, which allows you to print the 12 page booklet at will and leave in the rain or tear up in frustration! We'll be doing a round-up of autumn bouldering so please send any repeats, new problems or video links to us and we'll add you to the 'growing problems' database of Scottish bouldering for the next edition of Stone Country.